Is Coffee Losing Steam Among the Next Generation? "This is pure arabica, very mild," says Sinouk Sisombat, sampling his brew with a serious, self-satisfied air. "There is some acidity," he continues thoughtfully, "acidity is the mark of a great coffee." Sinouk, who was born in Laos but spent much of his life in France, is the president of the Lao Coffee Association and owner of a 50-hectare plantation on the Bolaven Plateau. Dressed in a cream-colored golf shirt and pressed slacks, he has the sort of dandified bearing that makes him an ideal ambassador for coffee destined for gourmet markets. His goal, he says, is to take the coffee grown in this remote, hilly region in southern Laos and sell it to the rest of the world. The quest to produce world-class coffee in Laos harks back to nearly a century ago. In the 1920s, French colonists staked out the fertile Bolaven Plateau for coffee plantations, realizing that the region's high altitude and mineral-rich volcanic soil were ideal for growing the crop. But within two decades, the promise of the small Southeast Asian country's coffee trade was dashed by a medley of violence. Upon the outbreak of World War II, many French plantation owners fled. Soon after, uprisings inspired by a mix of nationalism and communism turned Vietnam and then Laos, its neighbor, into a battleground. The American B-52s that bombed the sections of the Ho Chi Minh Trail that snuck into the Laotian jungle killed an untold number of civilians and contaminated many coffee fields with craters and unexploded ordinances. When the country's communists took over, coffee, then a bourgeoisie drink, stood little chance of falling into favor with the new leaders. Their efforts at rehabilitating the region focused on class enemies, not coffee fields. Sinouk's prominent family left Laos during the civil war and resettled in France, where they continued to prosper. In 1992, when the regime began to soften its stance toward private business and members of the old guard, Sinouk's father, who had headed the country's chamber of commerce before the revolution, returned and soon asked his son to join him to take part in their homeland's rebuilding. Sinouk chose coffee to make his mark, purchasing land in the heart of the Bolaven Plateau. He took his first bean samples to France's coffee-research institute in Montpellier to verify that it was worthy of the effort  they assured him it was. He recently added a lodge for travelers. Plantation owners like Sinouk have been part of a quiet rebirth in the Bolaven Plateau in which the region's wounded fields are being healed and once again producing world-class beans. The high-value but hard-to-cultivate arabica coffee cherries that the French originally planted are making a comeback, constituting a third of the total harvest. The majority of the beans are still the cheaper variety, robusta cherries. They were the only variety grown there between the '70s and '90s. Today coffee is the country's most valuable agriculture export; however, given Laos' tiny economy, it remains a small-time player in the global market. Laos' annual coffee-export revenues are in the tens of millions of dollars. Neighboring Vietnam, which has emerged as the world's second biggest coffee exporter after Brazil, generates billions of dollars worth of coffee each year. As such, the mantra in the land-scarce Bolaven Plateau is "quality, not quantity." Stephen Feldschneider, who went to Laos in the early '90s to work for an aviation company and later entered the coffee business, is similarly intent on cultivating a niche product. The bean varieties he cultivates are "not for truck drivers," the mustachioed New Yorker says. His Lao Mountain Coffee now supplies gourmet baristas catering to foreign consumers in Vientiane, Laos' capital, as well as some buyers abroad. Among his specialties is tipica arabica, a rare and rather finicky variety with a refined bitter-chocolate-jasmine taste. "You need to take real care of it, like a baby," he says. "There's a kind of renaissance taking place where people are relearning how to make good quality coffee," says Ben Hyman, of Emerging Markets Consulting. 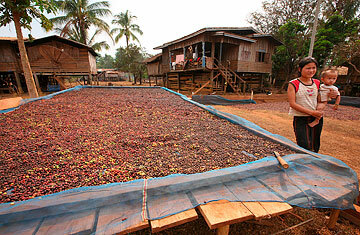 Hyman carried out an in-depth assessment of Laos' coffee sector for the World Bank last year. Rising coffee consumption in neighboring countries is opening new markets for Laos' product, he says. Trends in global supply are also working in Laos' favor. Poor yields in coffee giants Brazil and Colombia this year have sparked a 30-year high in bean prices as well as expectations that buyers will look to smaller suppliers, including China, Ethiopia, Uganda  and even countries like Laos  to fulfill ever rising global demand. The Singapore-based company Olam, one of the largest coffee traders in the world, has chosen Laos as a flagship country to start to grow its own coffee. Sawan Muthanna says the growth of the young crops he presides over as manager of a 3,000-hectare Olam plantation on the Bolaven Plateau is incomparable to anything he's seen in his native India, another emerging coffee-growing nation. "I've been managing plantations for almost 12 years," he says. "At two years, the growth is phenomenal. [The coffee] you see here, at this level, I don't think I've seen anywhere else." Industry experts expect that more big-scale corporate plantations will open on the plateau in the coming years, but, presently, the majority of coffee land in the area is run by small-holder families, meaning the industry's progress still rests on their backs. "A lot of farmers don't necessarily have the best practices," says Hyman, the market consultant. "Their crops might not be spaced properly. They don't trim the crop properly. This has huge effects in terms of productivity." In his report for the World Bank, he suggests that for the Bolaven Plateau to realize its full potential, further technical assistance from the public and private sector needs to be extended to small holders. Fourth-generation coffee farmer Khampay Keobounkuan agrees: "I want my son to keep up the farm, but I want him to improve it." Under French rule, his grandparents grew coffee, and their original small plot has remained the family business. His son, 16-year-old Keoudon, says, "I want to do better than my father." It's a very fair aspiration  his parents have been unable to rise out of poverty even though the coffee they grow would excite the palate of almost any American or European coffee drinker. Keoudon's father has already put him on the right path, having switched a few years ago from growing robusta to arabica cherries, for which he is being rewarded with his most profitable year yet. Sinouk and other coffee-industry leaders in Laos are nervous that bauxite (aluminum) mining currently under way on the fringes of the Bolaven Plateau will migrate farther into the region, which would deteriorate the landscape. Such concerns aside, Sinouk has put his faith in nature to determine the fate of Laos' coffee trade. "It's up to the rains," he says. In these parts, nature has been a most reliable asset. Read an expert's advice on how to drink coffee well. Read whether coffee is falling out of favor among the younger generation.